Lexus LC Performance, Engine, Ride, Handling | What Car? The LC is a more communicative and engaging car to drive than plenty of its competitors in any of its three available specification levels, but the keenest drivers will want Sport+, which really brings the car alive. Opt for top-spec Sport+ and you get a host of kit that makes the LC a bit more exciting on the road. 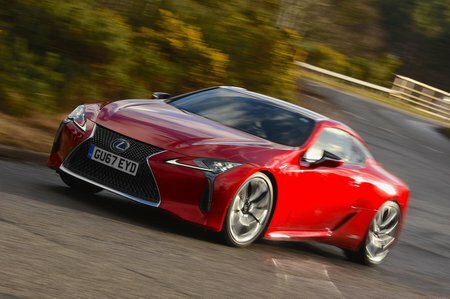 These go under the banner of ‘Lexus Dynamic Handling’ and include a variably geared ‘active’ steering system, whose directness changes depending on your speed; a rear-wheel steering system that augments its handling; and a limited-slip rear differential that works with the driver aids to keep everything in line and transfer power to where it’s needed. 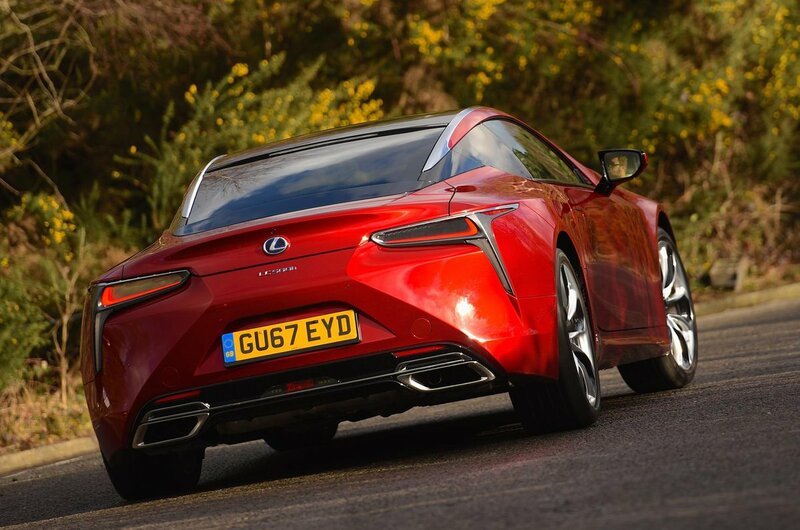 In this trim and linked to the V8 engine, the LC is a soulful and entertaining car to drive on a flowing road. It’s not quite as balanced or engaging through bends as a pedigree sports car, though, with the steering proving especially light and disappointingly short on feel. As for the rear-wheel steering system, it adds stability at high speeds and boosts agility, helping to turn the car in to corners at lower speeds. We also tested a standard-spec car, which is still decent fun to drive but, inevitably, not quite as well tied-down in bends. In more subdued driving, the LC is a decent companion. 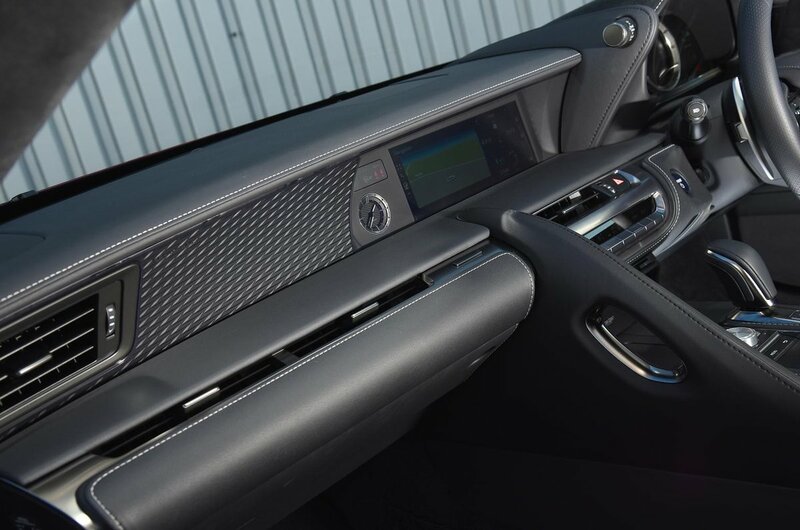 There are six driving settings to choose from, with the first four focused on normal conditions from town to motorway cruising. Fitted with run flat tyres as standard, the LC’s ride can feel a little wooden over really testing lumps and bumps, especially around town. Thankfully, it gains better fluency at higher speeds but, even so, you’re always aware of road imperfections – although they never become uncomfortable. It’s very quiet at low speeds and nicely hushed at higher speeds, but the LC ultimately lacks the smoothness and refinement you expect from a long-distance GT car. Lexus’ V8 is the LC’s best engine option, if not a perfect one. It is strong at high revs – with a wonderful sound at the top end – and a lot of fun when you want it to be, but feels short of the torque and drivability to move this two-tonne car as effortlessly as you’d like lower in the rev range. The 10-speed gearbox sounds like a gimmick, but it works well in automatic mode, provided you revert to manual mode for more spirited driving. It is tricky keeping track on so many intermediate ratios, though. The V6 hybrid unit is more economical and at times more refined, but the transition between electrical assistance and engine power isn’t always that smooth, especially when you push on. Due to the extra weight of the batteries and electrical system, the 500h isn’t as dynamically exciting as the V8. You feel that weight in the bends, with the hybrid less willing to change direction than its sibling. Unsurprisingly, it doesn’t sound as rorty, either, and Lexus’s attempt to make it more exciting by filtering imitation engine noise through the stereo speakers becomes irritating after a while. This isn’t helped by the whine of the electric motors that augment the V6 up front. That said, the hybrid is worth considering if you are buying the car based solely on its long-distance GT credentials. The range will be far greater than the V8’s, thanks to the improved fuel economy. Of the LC’s rivals, only a diesel-engined BMW 6 Series is likely to be better in this regard.